Discussion in 'Renegade Modified Tech' started by T.Jay, Jul 2, 2018. I’m in Las Vegas. My Renegade is running very hot 240-244. It shuts the AC off momentarily. The dealer is telling me that the Avid radius bumper restricts air flow. Thoughts?? Sounds like b.s. to me. I'm no expert but I think most of the air should come in through the grill. I can see your bumper restricting SOME air from the intercooler, but that shouldn't have any affect on the running temp of the car. I've been thinking about this since I've heard it before, bumpers restricting some air flow. The after market bumpers do restrict some air flow. The Renegade has a lot of vent opening below the grill, but the grill itself is not vented and only had a few hole in the lower inch or 2 of the front grill. I notice it when I was doing some stuff to my front adding the color change on the grill. I was thinking of drilling or opening up more hole to let more air flow but I have not had any heat issues as of yet and haven’t put and aftermarket bumper on. Only heat rise I had so far was going up hill on the freeway near the desert were the temp outside was going up at around 110deg. So yeah, I’ve been wondering about this issue with the new bumpers and wondering if opening up more holes or even hood vents might help some with this issue. I’m running the Avid radius on mine and haven’t had any problems cruising in triple digits. I don't have an Avid bumper but I did have one made copying one (because we live in Colombia and I'm not importing a steel bumper and getting my kidneys charged for it). They in fact DO restrict airflow because the grill, as someone else pointed out, only has openings in the lower third or so. More than half of the grill is for show. I've seen some people taking it out and drilling holes and they even sell an aftermarket one with the whole grill open. The main fault of the Avid bumpers is with the intakes they have which they solve by leaving the sides rather exposed to my liking. I had some extra covers on the sides of the radiator mount and my Renny ran a little hot (it even flashed a bunch of lights at me at some point because of that), then I had the guys that made the bumper for me get some extra venting in the front and the problem was solved. The original bumper has almost all of the air intake to the radiator come through it and not the grill, that's why some people (like us that drove 6-7 hours through winding uphills at high temperatures) get some overheating issues. I'm posting our bumper before and after the extra intakes we had installed so you can see the difference. In the pictures you can also see the grill not having all the little holes available for airflow, which I think might be my next mod. AK_Renegade, Adolfo Vasquez and Gatorade like this. That's a great looking bumper, especially in considering it's a one-off. You must be working with some talented folks down in Colombia. Custom work like that would cost a fortune in the USA. Maybe you could export those! Hey this was happening to me as well driving up the mountains in Colorado. I took matters into my own hands and haven't had any issues since! Just used a 2" bimetal hole saw and some flat black spray paint. I have done multiple tests and have had no more temperature rises above halfway where before it would get to the red overheat, shut off the AC and cut power. Was going to start a whole new thread once I get my snorkel installed to talk about some of the "custom" mods I've had to do to make things work. I have the 1.4l manual by the way. Wow, that's a mean looking front view! Nice mod's. It seems the Avid bumper badly needs a redesign. Thanks! I was pretty meticulous when measuring and drilling so it wouldn't look like a hack job. Still absolutely love the bumper regardless. We have had 0 problems and it is always hot in south Florida. The skid plate I got with the Avid bumper has angled slots and looks like it aims the air to hit the radiator to me. Look at the photo and you will see them. I'm looking to buy a steel bumper, mostly to get some recovery points for my 1.4t Sport. Regardless, the original bumper grill appears to have more usable surface area than the actual radiator grill. I have to believe that the Jeep engineers put a grill in the bumper for a reason. 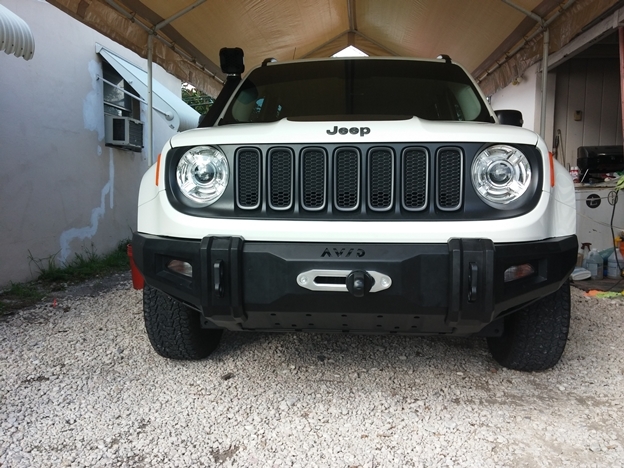 Have you done any low speed off-roading since installing the bumper? If I buy one, I'll likely drill holes like Danger Ranger (above) did. Mrsig do you have the 2.4 or the 1.4t because your bumper looks completely different than mine above. Mine would only previously overheat on hot days a/c on driving up mountain passes. It would do fine around town on those same hot days. Yes she has the 2.4L we have had it in 4th of July parade and a few other very slow moving parades in high heat plus been off road a few times too with 0 problems. I never had issues at low speeds, it only overheated when I demande high power high RPM's, that's how we knew it was a radiator vent problem. We had the holes opened and no more heat in high demand situations. Same here, only happened when the pedal was to the metal in 4th going up the mountains. 70 MPH on the highway and our temp would go down to 200 with the AC on. Our last trip was about 2.5 hours in 97 deg heat. Good luck with your problem. Driving on the flat wont do it, unless there's a mountain in florida I don't know about. I live in East County San Diego. It's about a 4500ft climb to the top of the mountain pass near my house. Going 70mph I have experienced similar heating issues getting to the top with the avid bumper. Removing the licensce plate cover helped a little, but I'm still getting to about 230-40 near the top. I'll try the drilling some holes and report back if it made a difference like others stated here. That is a sweet looking bumper. You happen to have plans for it?